In the interest of saving you time: this is a GLANCE at the Buzzz reissue. I haven’t thrown them yet. I also am not an expert on the original barstamps that were all the rage 8-9 years ago- so I can’t do a broad spectrum, all encompassing comparison. I can, however, let you know what they look and feel like, to help you with deciding to buy one. If at all possible: see it in person first. This will be next to impossible though, because most brick and mortar shops selling these discs have already sold their allotment. Discraft put out a message warning customers that the demand on the retail level was much greater than anticipated. I saw their announcement, and e-mailed my go-to online store, “Discgolfcenter.com” to inquire what my best bet was in ordering one. I got an e-mail in return a few hours later saying that they expected to put them in their available inventory sometime Tuesday afternoon/evening, and that I don’t need to worry about them selling out immediately. They were right- as they had them available for about two days until they sold out. I ordered a total of six (three on the first day and three on the second day per their limitations). At this point, there are a lot of them on eBay, as well as being sold by individuals on sites like dgcoursereview.com. The reason I recommend to see them in person first is the difference in shape. The first thing everyone asks me about these discs is, “How flat is it?” Out of my six discs, two of them are domey for a Buzzz. Two of them are very flat. The last two are something in the middle- which is most similar to the originals that I already own. I’m not sure how their domes will effect flight, and I won’t find out for a long time, because I’m not going to throw all six immediately. I will most likely only throw two and keep the rest for back ups until I need them. The plastic mix is quite nice- and they are opaque and not very see-through. This is what Discraft is saying is the “original” mix. My favorite of the ones that I ordered, in terms of plastic and color, is the deep orange/reddish one. The stamps vary from disc to disc- but the most noticeable are the foil stamps with the staggered square details inside. Only one of my six is Discraft’s plain paint hot-stamp (a personal pet peeve of mine, as it’s just lame looking). The WASP tooling on the inside rim is nothing to write home about. It’s not even really tooling at all- it’s more like the raised stamping that you see on the new Titanium discs. The height of the word “WASP” is barely raised off the disc, and the font is much thicker. It has the look of something that was added after the disc was produced. This doesn’t really bother me, since the disc is advertised as a reproduction of a classic. In any case, I do like the texture of the writing for my fingers to grab a hold of when gripping the disc for a throw. Here’s the Discraft explanation of the tooling from Discraft’s own mouth. I’m curious to see how people react to these once they are thrown regularly. Behind every legendary disc (the ching Roc, the bar-stamped Buzzz, the CE Leopards, etc…) there is a fair amount of truth, but it quickly becomes over valued as the discs grow rare. Will these have the reliable flight across the board that the original run had? If they do have that same flight, will they be worth just as much? We shall see. 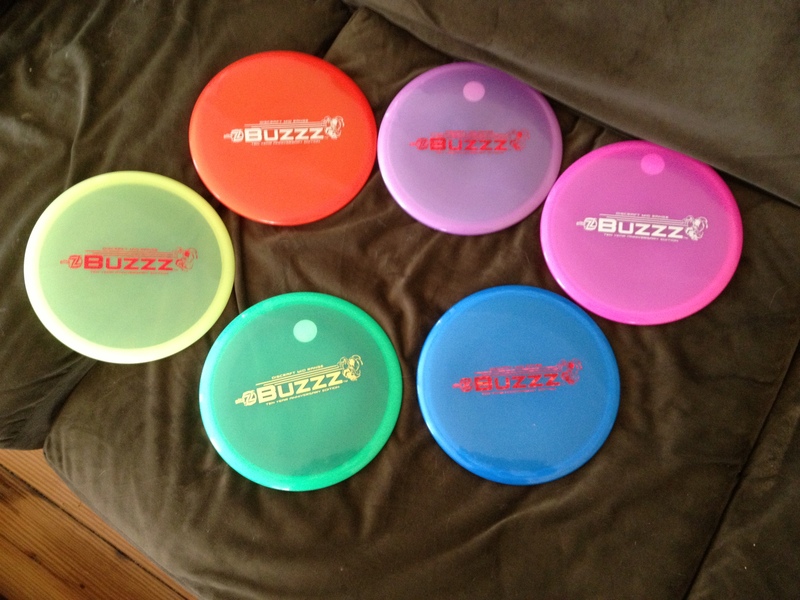 This entry was posted in Equipment and Gear and tagged 10th, anniversary, bar, barstamp, buzzz, disc, golf, stamp. Bookmark the permalink.